Counseling practices often feel they don’t have time or resources to dedicate to provider enrollment opportunities. But without a variety of credentialing successes, your practice won’t have the foundation necessary to create a productive revenue cycle. 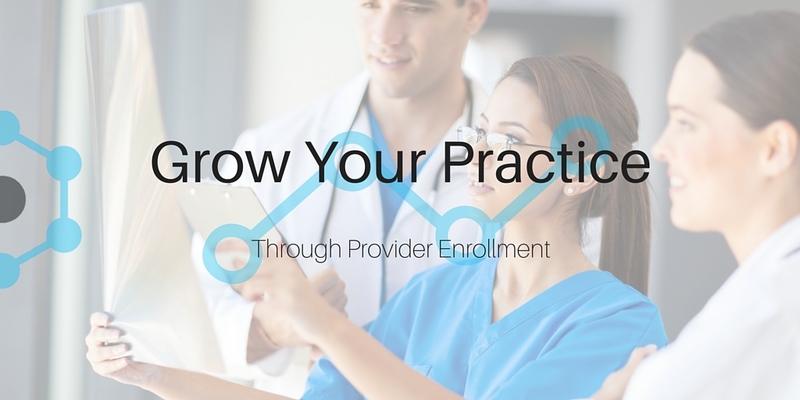 While provider enrollment isn’t the only way to grow your practice, it certainly is the only option that provides notable standards and practices for a successful overall business model. Providing your patients with a variety of enrollment options is the first step in developing a strong starting point in your revenue cycle. A strong foundational base for revenue and projections begins when your patients are able to decide which procedures, medications, and treatments are covered by their insurance at your office. Being credentialed with multiple providers reduces the likelihood you’ll accidentally accept insurance that does not cover your practice or your doctors. By cutting down on the number of procedures your practice has to cover because of a declined claim, you’ll see an increase in reimbursement and a decrease in liability and out of pocket coverage. A strong foundation for revenue starts with multiple provider credentialing. By offering your patients a wider variety of coverage options, you can provide them with more treatments for their overall health. It is important to do your research before credentialing to determine the best insurance panels for your area and your patients. After you research and credential you’ll be able to increase your revenue through more accurate reimbursement numbers and a decrease in declined claims from insurances carriers who don’t cover your practice. The ability to correctly project revenue, costs, and patient retainment and growth is key to developing a successful revenue cycle. Accurate projections help minimize the likelihood of lost revenue from a variety of different avenues, but accurate provider enrollment specifically will help decrease the likelihood of fines resulting from compliance violations or repeatedly filed false claims. Correct projections can make your business healthy and prosperous. More accurate projections help you make smart business decisions regarding new resources, higher salaries, or even employment growth opportunities. Provider enrollment ensures your projections are reliable and detailed, giving your boards, communities, and committees a better understanding of how your business is succeeding and the amount of money you have to invest in different areas. The most important part of the revenue cycle is the growth it produces. The bottom line is this—revenue grows when you file and refile claims in a timely manner, reduce the number of declined claims, and receive reimbursements quickly. These three steps will help you avoid stagnant monthly profits while growing your opportunity for overall earnings. More provider enrollment cuts down on uncovered procedures and unfiled claims from occurring frequently. With more insurance coverage options your practice will minimize wasted funds and start turning those coverage liabilities into reimbursement opportunities. An increase in provider enrollment also allows for new patients to emerge through your newly offered insurance coverage. Revenue will grow as you adopt a variety of insurance options for your community. More revenue leads to overall practice growth through new opportunities and continued board, committee, and community support. Provider enrollment ensures your revenue cycle is solidified from beginning to end. By giving your patients more opportunities to use their insurance coverage and more effectively monitoring which procedures and treatments you can actually cover, your revenue cycle will begin to yield higher profits. Provider enrollment is a worthwhile investment, of both time and resources, to guarantee your practice is efficiently and effectively running as a coverage option for a variety of patients.